I want an "Auntie Mame"! Where can I start on talking about the best movie of all time (in my opinion)? My experience with this particular film started when I caught the movie by accident on Turner Classic Movies because I had heard it was a funny movie. 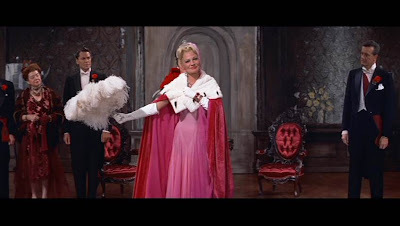 Suffice to say, I couldn’t stop laughing from the incredible kaleidoscope opening titles to the end about two and a half hours later, when Auntie Mame says, “I’m going to open doors for you, doors you never even dreamed existed. Oh, what times we’re going to have. What vistas we’re going to explore together. We’ll spend a day at an ancient Hindu temple. The head monk is a friend of Auntie Mame’s. And perhaps he’ll let you ring the temple bells that bring the monks to prayer. And then on the highest tower, you can see the Taj Mahal. 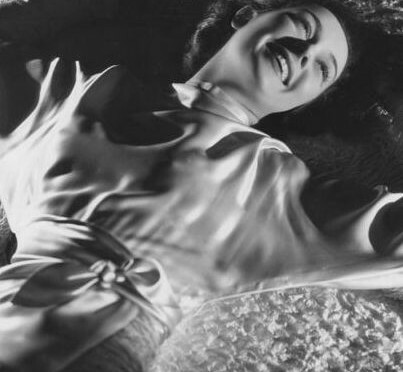 Beyond that is a beautiful…” as her words fade into the glittery rhinestones that spell out “The End.” There is something unbelievably magical about this film and this is THE film that brought Rosalind Russell the actress into my view. 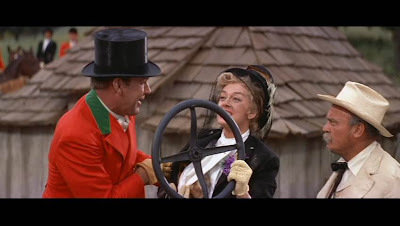 Not long after enjoying this movie for the first time, I received the book it is based upon, Auntie Mame: The Irreverent Escapade, which in turn introduced me to the marvelous comic writing talent of Patrick Dennis. 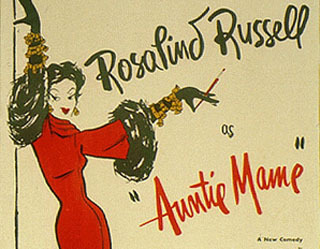 Anyone who has seen this film has probably noticed that the little boy who Auntie Mame has taken charge of is named Patrick Dennis. Well, the boy is loosely based on Patrick Dennis the author (whose real name was Edward Everett Tanner III). Long story short, I could not put this book down because it was just brilliant and so darn witty. 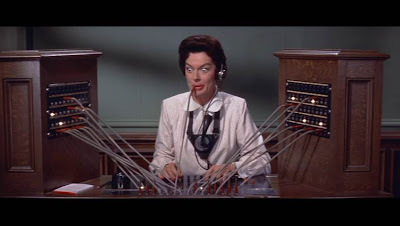 As soon as I started reading it, I could seeRoz as Auntie Mame. 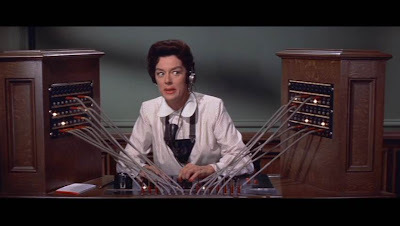 Once I finished that book and saw the film again, I knew Roz was Auntie Mame. 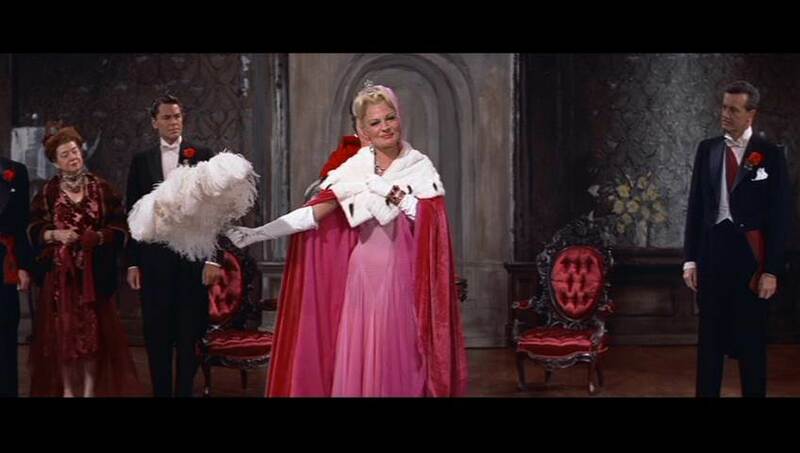 There was just no comparison between her and anyone else who may have played the part on stage or on film in the comedy or the musical version. (P.S. 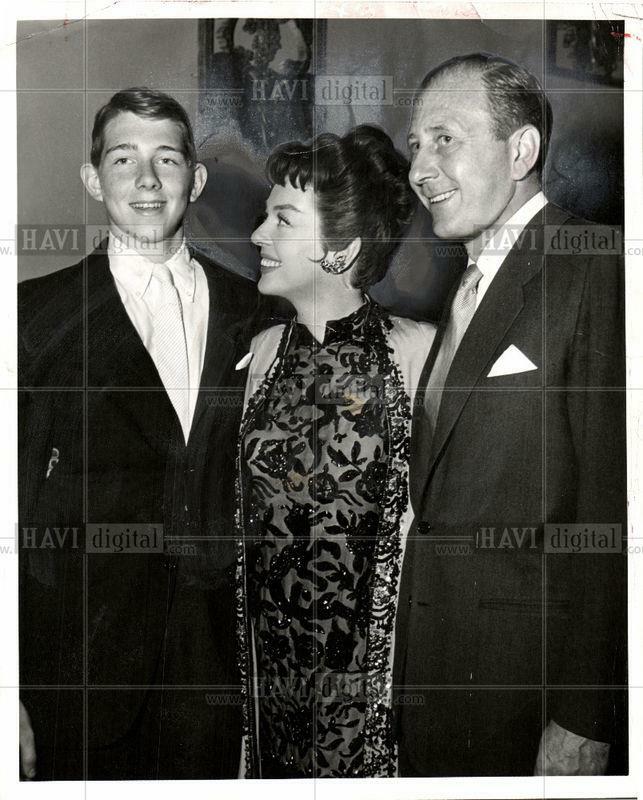 If you didn’t know it already, Roz originated the role on Broadway just a couple years before she did the film version, being replaced by the great Greer Garson while she filmed the movie). Now, let’s talk best scenes. I personally could say I just adored every scene and was entertained by everything, but to pick a few favorites isn’t hard. A favorite scene of mine involves Auntie Mame getting a very small part in her best friend Vera Charles’ play “Midsummer Madness.” Now, Auntie Mame’s best friend Vera is a piece of work, let me tell you. First of all, she is from Pittsburgh, but speaks with a pretentious British accent. 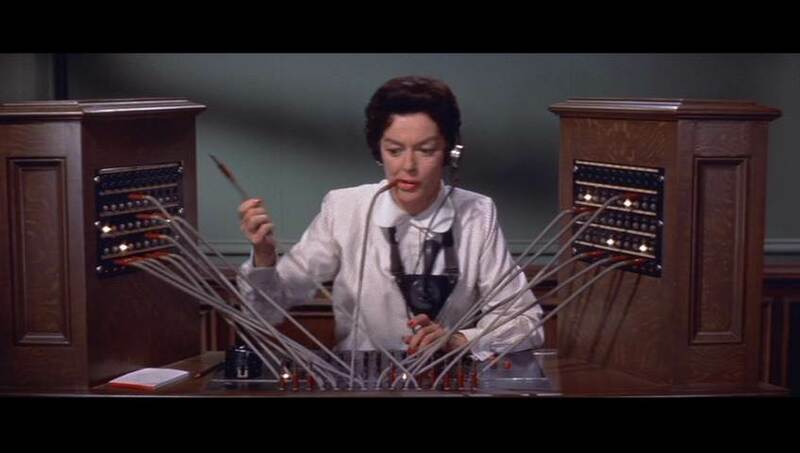 As the following conversation between Auntie Mame and young Patrick proves, what else was she to do? She is the star of this play and acts like a star through and through. 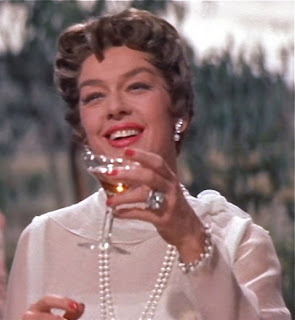 Auntie Mame, on the other hand, having a very small part, decides to bring some very flashy and very noisybracelets to make herself stand out in the thankless part. 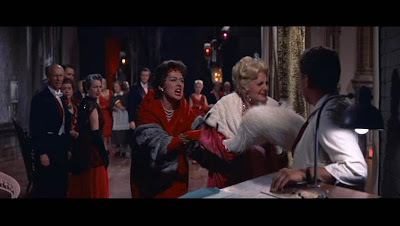 This only causes trouble, as one can deduce… She causes so much of a ruckus with her bracelets that she ruins the entire play and even gets her gaudy bracelets stuck to the back of Vera’s cape. This is what I call funny physical comedy and I enjoy it every time I watch it. Mind you, anyone would get tongue-tied trying to say names like Widdicome and Bibberman, but we don’t have to say them. 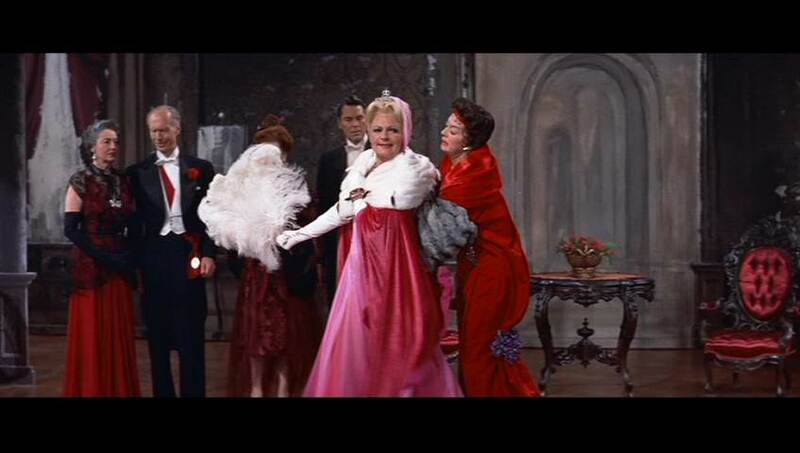 We just have to watch Auntie Mame get tongue-tied and laugh our heads off. While there are so many specific scenes I could keep talking about, I have to end with probably my favorite scene. I call it “Auntie Mame and the Horse Capers.” After she has fallen in love with Beau, she mistakenly lets an ex-girlfriend of his know that she knows how to ride a horse (of course she cannot), and so she’s got herself stuck at a fox hunt “riding to the hounds” with the rest of the southern family and friends. 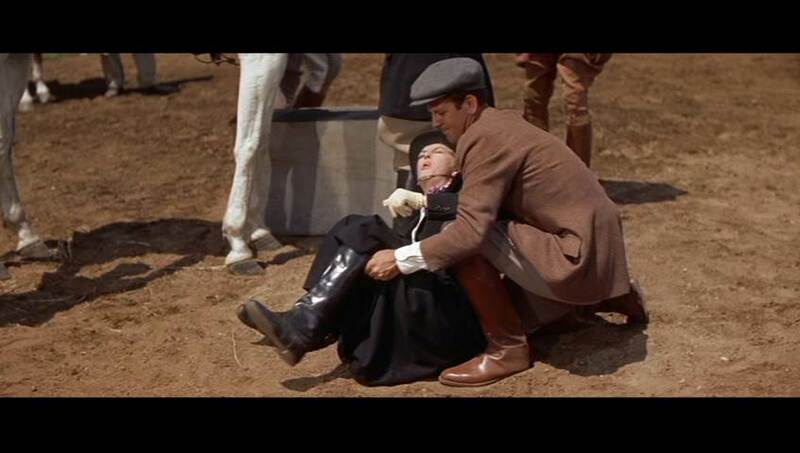 In my opinion, this could not get funnier, as she is wearing riding boots that she can’t even put her whole feet inside, and then is given an evil horse from hell named “Meditation.” Once she finally ends up on the horse, it goes riding off in the opposite direction, trampling over flowers, passing the hounds and even the fox, in the end jumping over the veterinarian’s truck. Auntie Mame lands in a bush, holding the steering wheel and the fox nestled under her jacket. 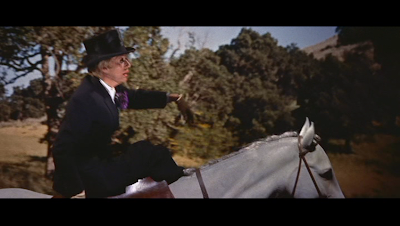 I have to mention a character who doesn’t even come until the second half of the movie named Agnes Gooch. This character was not nearly as funny in the book as Peggy Cass made her out to be. The woman should be applauded for making such a hilarious character come to life. Mame: This will calm you down. Agnes Gooch: Oh, no! Spirits do the most horrible thing to me. I’m not the same person! Mame: What’s wrong with that? Agnes Gooch: Will it mix with Dr. Pepper? Mame: He’ll love it! Drink! Ha! I have repeated that line everywhere from my home to the supermarket (after all, there is Dr. Pepper there). I can’t get enough of it. I could obviously go on and on about this magical movie that is about the only thing that’ll make me happy when I am having a really depressing day (I walk away from it smiling every time), but then this post might never end. I actually started writing this for a little website I am making for a class (I needed content to add), but this has been fun and the full article is going here on my blog and not on the website, obviously.